Gooooal! Shone Youth Sports Project is a Win! Our Shone Youth Sports Project has been up and running for a year and we are thrilled to share some of the progress we see playing out on the soccer field. Two board members visited the Hadiya Zone last month and met with the 22 boys and 18 girls currently enrolled in the program. These at-risk kids, recruited from local schools, are learning not just the fundamentals of the game, but the sense of pride and commitment that comes with being a part of a team for the first time. They have uniforms, two experienced coaches, and the guarantee of a nutritious snack after their twice-weekly practices. Perhaps most importantly, they are working hard and having fun. Take star player Meselech Kanke, the 16-year-old striker and captain of the girls’ soccer team: Meselech is the youngest of five siblings and an 8th grader in the Shone village. Her Father passed away when she was a baby and her Mother relies on their small plot of farm on the outskirts of town to provide for her family. Meselech wouldn’t otherwise be able to afford the luxury of an extracurricular like soccer were it not for the Shone Youth Sports Project. Before she joined the team in 2016 she lacked not just resources but self-confidence. Today Meselech says she wants to be a professional soccer player when she grows up. After watching her moves on the field we see no reason why she can’t turn her dream into a reality. Both the girls’ and boys’ teams have had a nice taste of competitive success. Recently, the boys’ team traveled to Arba-Minch (165km south of Shone) for a tournament. For these boys, it was a first-time chance to venture beyond their neighborhood confines. They didn’t win the game but their proud coach says the team’s sense of borders opened up in a profound way that weekend. We are so impressed by the boys’ performance and wish for them more shared adventures on the road. We are blown away by these kids’ promise, on the field, and in the world. And we want to grow the program to live up to their enormous possibility. The teams had two heartbreakingly humble requests for the season ahead: The players need regulation soccer balls and proper soccer cleats to replace their old flat-soled Chuck Taylors. As girls’ captain Meselech explained, “Because the soccer game involves running on a hard surface, a decent soccer shoe is a must for all player.” Without new shoes, the kids are at risk for foot and ankle injuries, especially as the level of their play increases. We believe in Meselech. We believe in her teammates. We believe in those boys who had the courage to travel far and play hard. 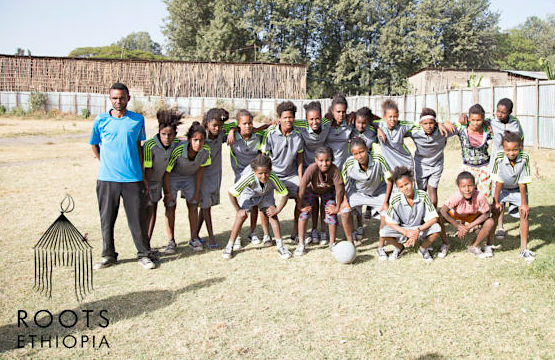 Please email us at info@rootsethiopia.org for more information about the Shone Youth Sports Project. Previous Previous post: 7 Incredible Things YOU Did in 2016!